Phuket cafés and coffee shops keep popping-up (and closing) all around Phuket Town, mostly around the old streets of Thalang, Yaowarat and Dibuk. In recent years Phuket town has become a very popular tourist attraction and a fun photo playground… and as photographers and models seem to need frequent coffee breaks, cafés just appeared by magic. With so many people wandering the streets in the sun all day, there was an obvious market to grab. The young generation of Thai knew what to do and one thing many of them have in common is that ‘old vintage’ look made of a bric-à-brac of colourful faux-old decoration. It doesn’t matter: people love them! In other countries they might have call them ‘Bars’ but apparently ‘Cafés’ was a lot more appealing, even though the main coffee shops listed below are definitely bars. They do serve cakes or meals and they are a nice addition to an exploration day. 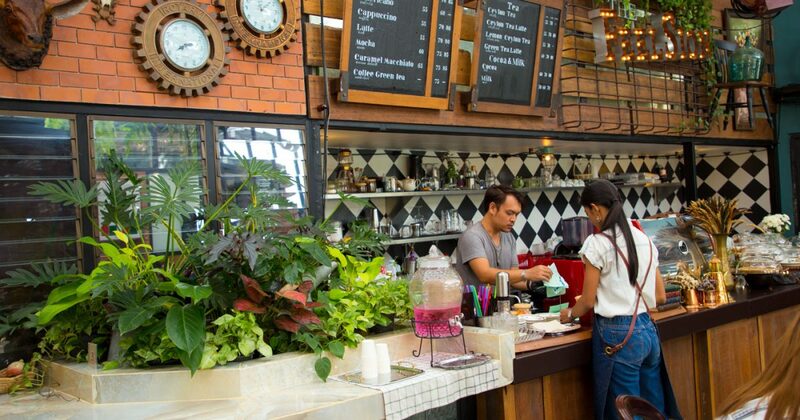 Here are a few cafés for you to start with, and we will keep adding them as we visit them. 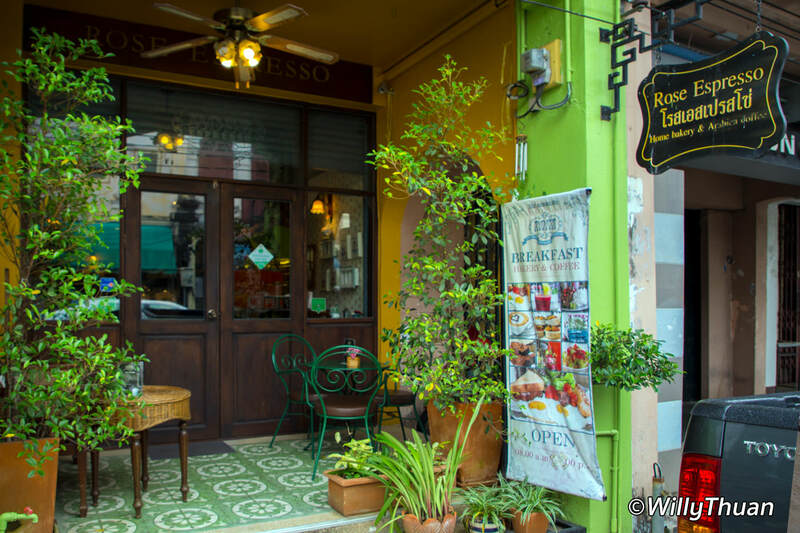 Coffs & Burgh is a beautiful café as well as a souvenir and antique shop found on Thalang Road in the heart of Phuket Town. Cakes and drinks are great to take a well deserved break from your exploration, but it’s also a fun photo opportunity. Coffs & Burghs set some Old Phuket town backdrops specially for visitors to take extra selfies! How smart… and it obviously works. 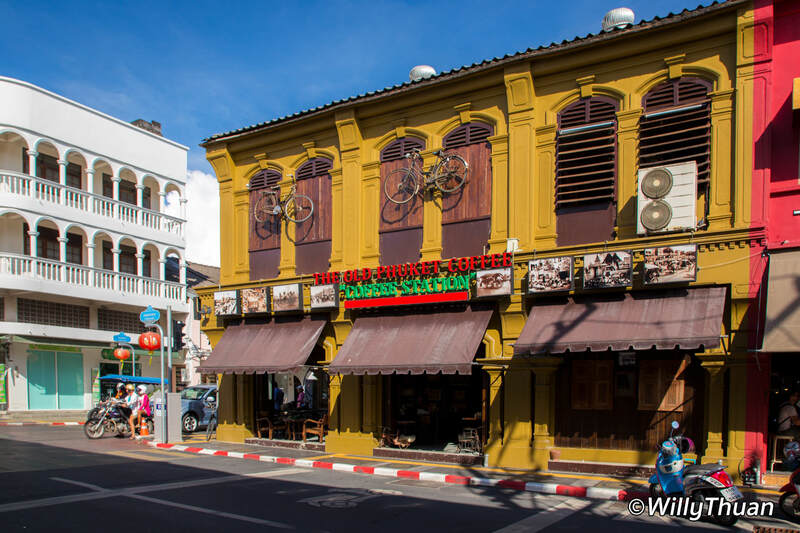 The Old Phuket Coffee is one of the most popular bar in the old part of Phuket town. They were an instant success for 2 reasons. First, they have a very strategic location at the intersection of Yaowarat Road and Thalang Road. In addition to the golden spot they did a great deal of effort to decorate the bar in an old Phuket Style. Dark old wood with old radios and miniature Thai houses hanging in the walls. Outside is just a s fun with old bicycles in front of the windows. Old motorbikes and photographs from the past make The Old Phuket Coffee an irresistible tourist magnet all day long until late. The place is particularly busy on Sunday afternoon as it sits at the very beginning of the Phuket Sunday Walking Street Market. Prices are normal to high for this part of town. They serve a decent choice of Thai food but not really Phuket food. A beer will cost you 70 to 90 baht and a soft drink 35 baht. A coconut is 80 baht. A fried rice is 150 baht and a Pad Thai 120 baht. 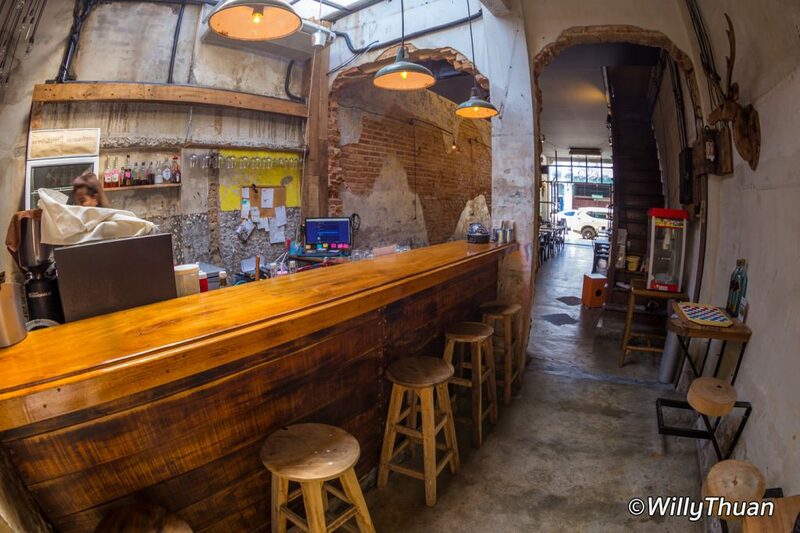 Eleven and Two is another favourite bar on Thalang road. This place has been often for a couple of years and seem to have found the formula to be inviting. The front of the shop is widely open with a couple of inviting seats on the terrace. 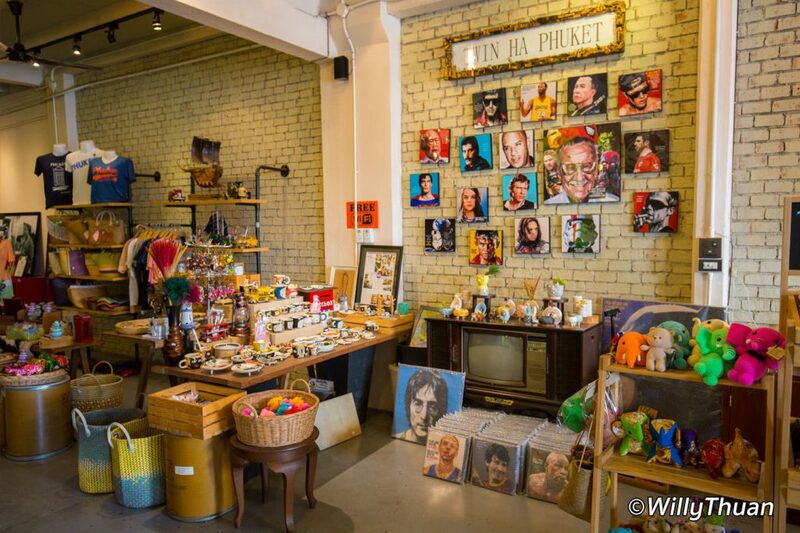 Inside, you can browse a bric-à-brac of souvenirs, so people tend to stop and have a look. Once you walked in, why not have a drink, right? Prices are also a little higher than usual. They also serve some local craft beers Chalawan and Chatri for those who like craft beers. Craft beers seem to be the craze of the moment, but it’s not mine. Chalawan starts fruity and turns bitter on the second sip. Eleven and Two also has a air con room, much welcome during the hottest months, usually April and May. 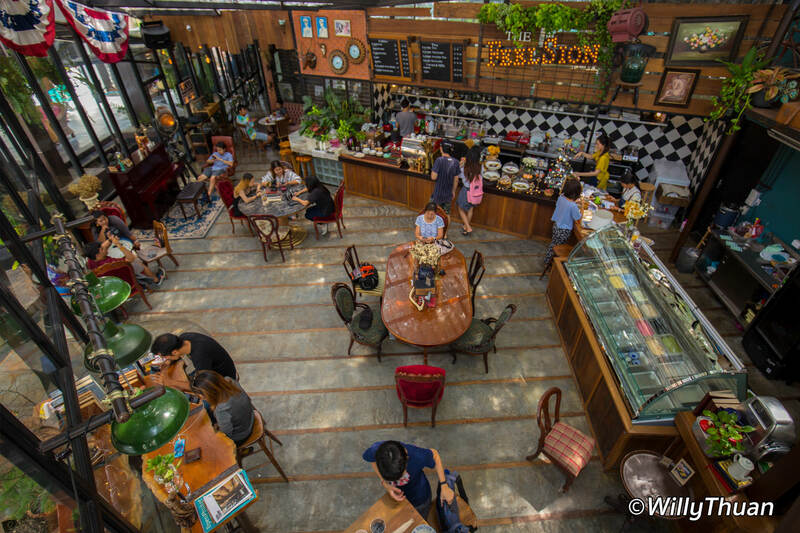 Feelsion Cafe (not Feelston as some try to call it) is a beautiful and unusual coffee and cake shop found in a tiny alley near Sapan Hin, quite far from the historical streets of Phuket town. Full of vintage items including a skeleton pointing at the toilets and an electric chair (don’t think it was a real one, hopefully), Feelsion has a strong industrial mining look. Made of high windows, Feelsion is bright, surprisingly large with several rooms. It seems to be a popular place with the upper class of Phuket. Another very small café located just opposite on the Thai Hua Museum on Dibuk road. Rose Espresso serve beautiful cake, waffles and other sweets. You can get an excellent all day breakfast too, including egg Benedict! It’s cute vintage design with a lots flowers is what catches most people attention. Popular for its espresso of course but also for its teas and great smoothies. Don’t miss the cheese cakes and pancakes. It’s really tiny so hope there is a set left for you. 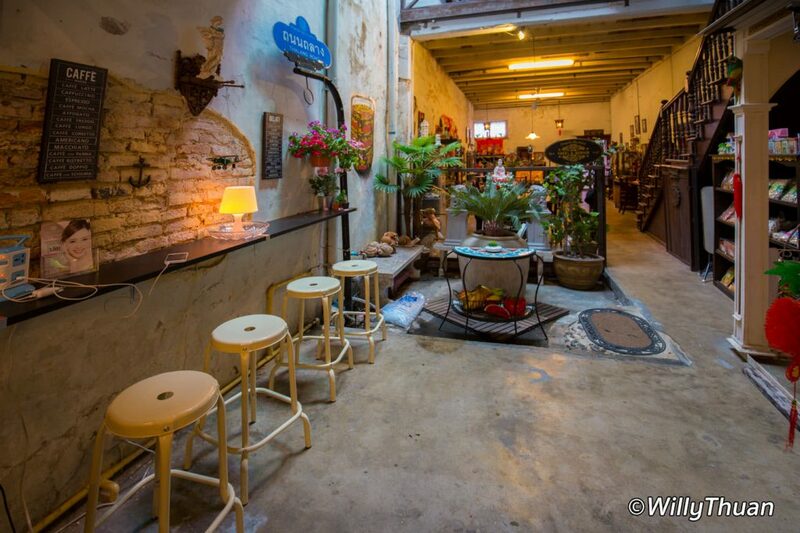 A cool little place found just outside the historical streets of Phuket town. Nee team good coffee and good casual Thai food. The design is mostly ‘faux run-down’, the way young people like it in this part of Phuket Town. Their most popular dish is the Crying Tiger, a Thai beef sirloin steak served with spicy sauce, and grilled chicken. For the classics you can always order a good old Pad Thai. Atmosphere is easy-going, maybe a bit slow, and they play jazz music in the background. 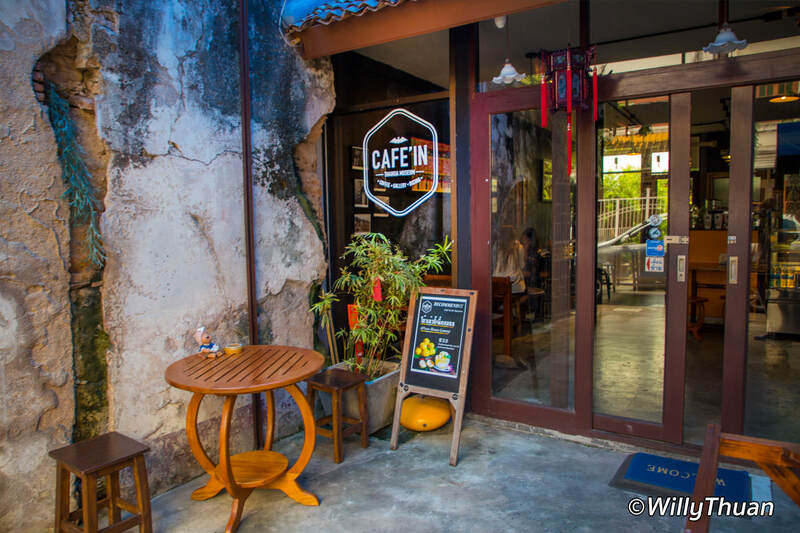 This is probably one of the smallest cafés in Phuket town, located just in front of the Thai Hua Museum. Popular for their Thai milk tea and mango crepes but also for their locally made jelly in honey syrup with fresh lemon desserts, a popular treat among locals.